Over the years of reading Buddhist and Stoic writings, I've noticed that authors from both traditions refer to what, in my mind, is essentially the same concept. What the Buddhists call "kleśa" is what the Stoics understood as "pathos". Sanskrit "kleśa" is usually translated as affliction or vexation. Pathos from the Greek means suffering, emotion, feeling, or calamity. The former are produced from desire and ignorance of reality (i.e., wrong views). The latter are produced from irrationality, which is effectively the mind left untrained and unlearned, which in the Stoic context means being unable to internally accept and assent to all external experiences. The Buddhist and the Stoic both aim to understand the causes of mental (not physical) suffering, and then through persistent mental training and contemplation sanitize the mind of all such experiences, leading to an irreversible state of contentment. This is not happiness, but simply the absence of desires, fears, sorrow, anger, etc. Śākyamuni Buddha represents the Buddhist ideal: a sage freed from all kleśas. He neither weeps nor expresses anger, even if it seems warranted according to mundane reasoning. Such a hero would have been immediately appreciated by a Stoic, whose idealized figure would comparably have been freed from all such emotions and fears, albeit with a different conception of the cosmos. Stoics believed in a fate crafted by an intelligent force beyond human comprehension, symbolized by Zeus the Demiurge. Buddhists, however, believed sentient existence was a recurring cycle caused by karma (action) generated throughout immeasurable past lives. Nevertheless, Buddhists and Stoics were both chiefly interested in the question of suffering. 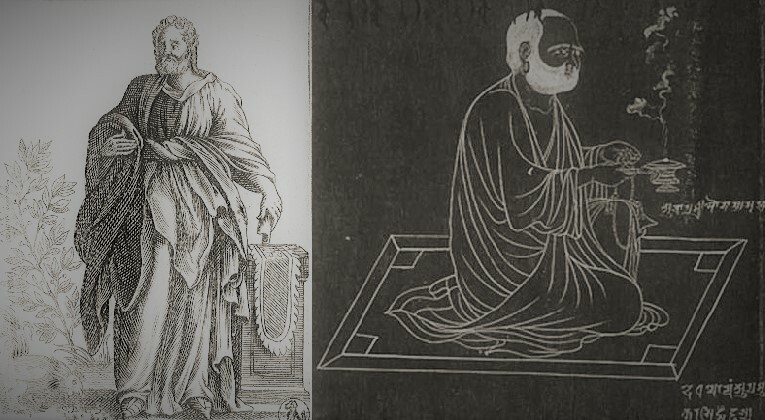 The Neoplatonist Plotinus, I imagine, would have appreciated the teachings of the Buddha. Plato and all later Platonists believed in reincarnation (in Greek metempsychosis). Plotinus believed the world of materiality had to be abandoned in order to achieve an elevated and permanent divine state. To engage with matter was to become enmeshed within it, resulting in the perpetual cycle of misery experienced past and present. 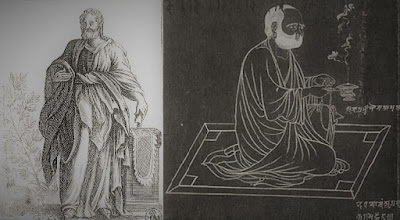 I feel that Plotinus' ideal is comparable to that of the arhat in Buddhism. The arhat is an enlightened being who has purged all kleśas from his or her mind, and consequently permanently halted the cycle of rebirth. The arhat at death will not return to existence in this or any other higher realm. One of Plotinus' successors, Iamblichus, argued that the material world and all its hardships are, in fact, by the design of the Demiurge, and therefore such a skilled crafter of Creation would not make a mistake. The wise aimed to become extensions of the Demiurge themselves through the practice of theurgy (rituals), in which they positively engaged with the world of matter, rather than attempting to flee from it. Rather than eliminating disagreeable experiences, one was to become a sort of custodian over all such things by exercising the divine or rational part of the soul to manage the other half, which was animal and governed by base instinct. This animal part of the soul was by divine design and as equally necessary as one's faculty of reasoning. In other words, instinct and reason were equally important. The end result was ascension into divinity, but remaining present as an active member of the cosmic order, in contrast to some of his predecessors who sought a permanent escape. Many such sages were believed to act in a benevolent manner, assisting other souls and facilitating their eventual ascension into the divine. Iamblichean Neoplatonism brings to mind the Buddhist Mahāyāna, in which the ideal is to become a bodhisattva or awakened being, dedicated to benefiting other beings. The bodhisattva remains active in the ordinary world, but does not suffer, since they possess wisdom, but at the same time they do not flee the world, since they possess unconditional compassion. Of course, there were stark ethical differences between these two schools. Theurgy, like most ritual practices of Antiquity, appears to have practiced blood sacrifice, whereas Buddhism expressly forbids this. Also, Buddhism rejects the concept of a Creator deity, whereas Platonists conceived of a polytheist pantheon that collectively could be understood as a Demiurge or Creator. Buddhists placed their sages above the gods (devas), whereas Platonists, as far as I know, generally did not assert that a human soul could ever surpass a god.